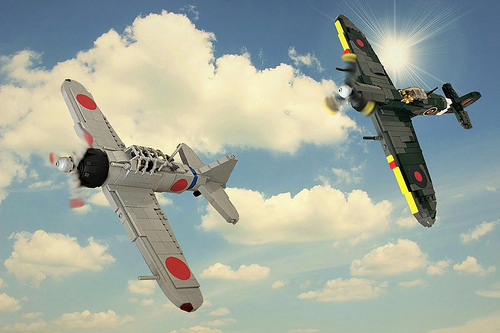 A Second World War themed LEGO airplane fleet is a rare sight to behold. 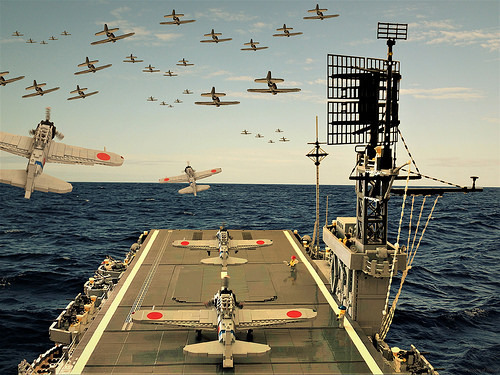 This image by Allen Lim looks amazing, even though the Japanese Zero fighters are multiplied digitally. Obviously my favourite part is the effort put into editing, but that should not overshadow the excellent work on the aircraft carrier and the aircraft itself. There are some shapes around the cockpit and on the wings that are very impressive once you take a closer look and think about how they are done. I think the best way to view this aircraft is in combat in a dogfight with a Spitfire. Allen has been building military aircraft throughout February so expect to see more from him in the near future.